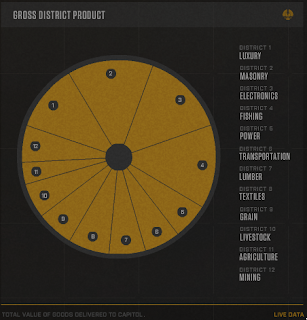 Hunger Games Lessons: What's Your District? Observant fans of The Hunger Games noticed a strange hashtag on the Lionsgate® credits page after the teaser for "The Hunger Games" movie was aired. It said #whatsmydistrict. After further examination, they realized it was connected to the new website TheCapitol.pn. When I checked out the site, I got a strange message to identify myself. It connected to my Twitter account and tweeted the message: “The Capitol knows who I am. Identify yourself immediately: http://thecapitol.pn #whatsmydistrict”. The background image, which was garbled and pixelated, moved, as though it was trying to come into focus. As it moved, the sound coming from my computer was a succession of short eerie screeches. Each day the site has become more clear, now showing off the Capitol seal, and today it went completely live. I registered and was placed in District 7. I am waiting to claim my District 7 Citizen Identification Card (the process can be expedited by connecting with your Twitter and Facebook accounts). What I am MOST excited about is the new information the site reveals. It shows each of the districts' industries (finally! See picture, above) and how much tesserae is claimed by each district (below). 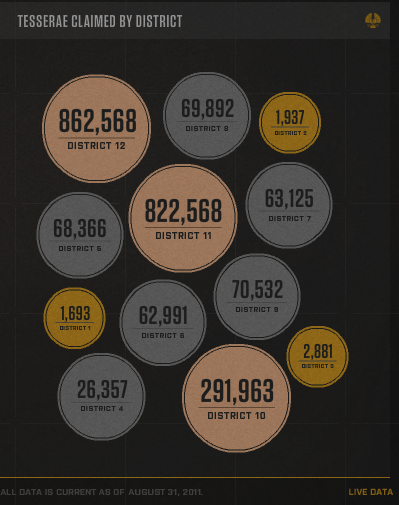 District 12 has the most, and since we know it is also the smallest, it confirms that it is the poorest district, as well. I can't wait to look at my map of Panem and update it with the new information. (If only it was still summer and there was more time in the day to dig deeper this website and their Twitter and Facebook accounts!) There's also a scrolling message board that announces the weather as chilly (wear a coat), condolences to District 12 families for mine explosion (and urging citizens to donate to the cause) and a teaser about Caesar Flickerman's hair color. I'm excited they are giving the fans something to not only discuss, but occupy our time as we eagerly await the movie premiere! Will you have your students register? I will have mine (it seems you still can register even if you do not have Facebook or Twitter). The amount of tesserae claimed by each District. Since District 12 is the smallest in population (about 8,000 people) it obviously has the most citizens living in poverty. What else do you think these numbers reveal? Theories? The images are screenshots from TheCapitol.pn and as stated on their site: "Pursuant to Panem Law, Materials Appearing on This Site Are Government Owned and Protected." My kids will love it!!! My 8th graders will begin reading the book this week!!! Awesome! I've decided that district placement must be completely random. I wish there was a way to "expedite" processing other than Twitter & Facebook. Most of my students have Facebook accounts, but it is blocked at school. I wonder how long we will have to wait to be "processed"?! :) Have a great year! DISTRICT 12 REPRESENT! I HAPPEN TO HAVE A SITE THAT TEACHES YOU HOW TO USE YOUR AURA FOR ELECTRICITY AND SUCH SO YOU ALL BE GONE WITHOUT EVEN KNOWING! I am slightly confused...If you click the twitter link is something supposed to happen immediately? It should bring up a pop-up window to post a tweet to TheCapitol. But other than that, nope, nothing more going on there. You can slide the page to reveal the new information. However, check out Panem October (www.panemoctober.com). It goes completely live this Saturday and fans can interact and experience the Hunger Games from a unique perspective. Right now you can follow various characters & you will actually get your own Capitol ID badge. I got District 4, but I don’t know what to do after that. It says expedite, and so I clicked it, now it’s asking me to explain why the DIPs for District 4 should be processed first and submit to Facebook? I think you can type in anything. They just tally the number of posts on Facebook and Twitter and the district with the highest amount of posts opens up next. District 12 has been opened (they also had more citizens, I believe); District 8 is opening up now. Hopefully district 7 is next, but last I checked district 9 was very close. Evidently you can do it several times a day. I think I'm annoying my followers who aren't Hunger Games fans, though! lol Eventually they'll have to all open up, so I wouldn't worry about it. Also, the site has been very buggy lately. Last night it crashed (and so did Panem October). Good luck! You'll get your own badge on TheCapitol.pn, as well. Check out Down With the Capitol's post about it. YAY!! I'm in district 1! How can I delete what's my district? I want to try to get a different district. Finally...an Official Hunger Games Movie Trailer! Congrats to the Winner in The OC Blog Giveaway! Fabulous Free Downloads in this Free-For-All! Win Hunger Games Trilogy Teaching Units! Last Day for Back to School SALE! The Capitol: How Do You Envision the Characters?